Welcome back to the blog! We are now back to our regular scheduled programming here on the blog, and were going to kick it off by talking about my new hair! I have yet another crochet braid installation, and yall know I have to give you guys all the details! You guys know my stylist Shirley hooked me up, and this time I wanted some long hair! I was going to just do an all black style, but I needed a pop of color. You can never go wrong with blue in my book, so I grabbed a pack of blue hair, and this fabulous hairstyle was born! 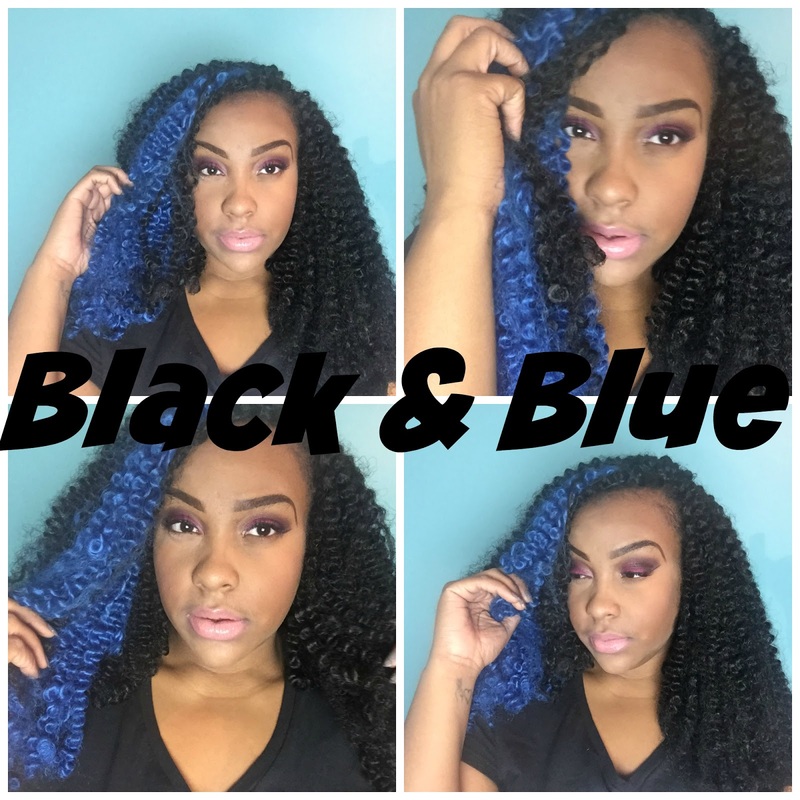 For this style I used 5 packs of the Harlem 125 Brand of Kanekalon Braiding hair in the color 1 and 1 pack of the color Navy . To achieve the curls in this hair I used small perm rods, and followed this tutorial here. This is the same method and hair that I used for my last crochet braids. I just used a different color, and didn’t cut the packs in half. I would recommend getting more hair then you need just in case. I love this curl pattern sooo much! It’s a very tedious and long process, so be prepared! Every night I put my hair in four bantu knots, and I just put a silk bonnet on my hair and go to sleep. I slick my edges down with the Design Essentials Natural Honey & Shea Edge Tamer that I received in my curl box a couple of months ago. 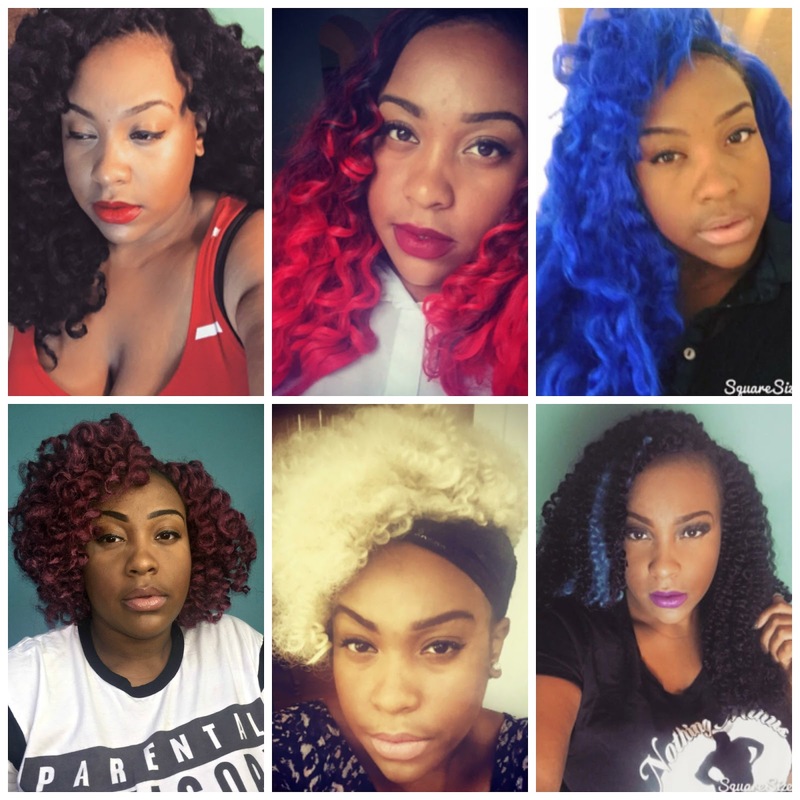 I am really loving crochet braids! It has been my go-to style all year, and there is no telling when I’m going to give it up! Here is just a quick view of all my crochet styles that I have done this year! They are such a fun and inexpensive way to switch up your hair! So ladies that’s it for today’s blogpost! Be sure to meet me back here tomorrow for your second blogpost for this week! Feel free to follow me on social media! They are all linked above! I would love to be connected with you! Until tomorrow, love ya lots like tator tots!